A cab driver who was rescued on Sunday from an Oakland estuary has died, officials said. 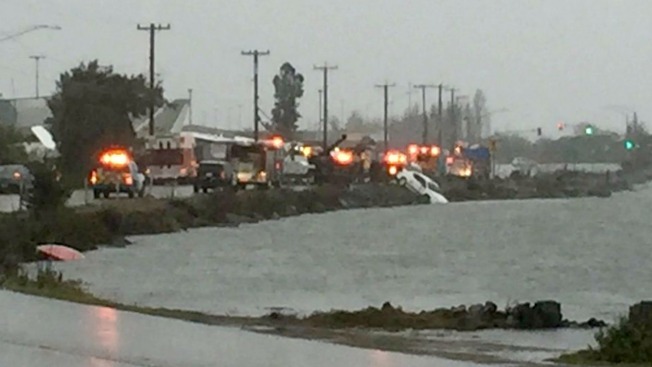 The driver veered from the roadway around 8:05 a.m. before sliding into the body of water, which is located near the Oakland airport. Initial reports said two people were possibly trapped inside the submerged vehicle. Rescue swimmers with both the Alameda County Sheriff's Office and the San Francisco Fire Department's also responded to the scene. One victim was taken to Highland Hospital, although it was not immediately clear if they were the same person that died. A storm that arrived in the Bay Area Saturday has brought heavy winds and rain, resulting in flooding and downed trees in many parts of the region. It was not immediately clear what caused the vehicle to go into the water.